Cynthia Hogue’s poet’s essay, “On being ‘ill’-informed: H.D.’s late modernist poetics (of) d’espère,” appears in Jacket2, July 9, 2018. 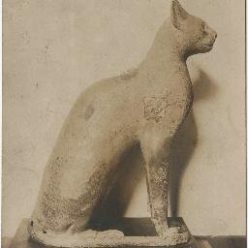 This essay spans H.D.’s poetry and prose, from Trilogy and By Avon River to The Sword Went Out to Sea, Helen in Egypt, Vale Ave, Hirslanden Notebooks, and Hermetic Definition. Hogue combines disability studies and feminist poetics to explore the later years of H.D.’s career. One new review of H.D. Scholarship came out this autumn. 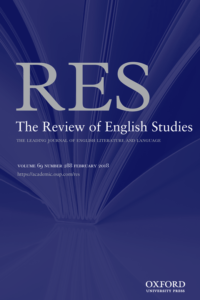 Rebecca Bowler reviewed Lara Vetter’s A Curious Peril in The Review of English Studies published 8 Dec. 2017. In the past, she also reviewed Matte Robinson’s The Astral H.D. in Literature and Theology (Dec. 2017 issue). Michael Boughn’s new poetry collection, Hermetic Divagations – After H.D. (Swimmers Group, 2017) embraces the poetic method of H.D.’s Hermetic Definitions to arrive at a wholly new reflection on the many questions H.D. posed about war, love, spirituality, and survival–questions that retain their relevance for us today. Michael Boughn is the author of several books of poetry, including Cosmogrophia: A Post-Lucretian Faux Micro Epic (2010), which was nominated for the Governor General Award. Two recent articles focus on H.D.’s contributions to the visual arts through her elaborate embroidery projects. Elizabeth Anderson’s “H.D.’s Tapestry: Embroidery, William Morris, and The Sword Went Out to Sea” appears in Modernist Cultures, vol. 12, no. 2 (2017). Linking H.D.’s tapestry work both to her spiritualism and to her inspiration in the Pre-Raphaelites, Anderson explores H.D.’s use of tapestry in her late novel The Sword Went Out to Sea. 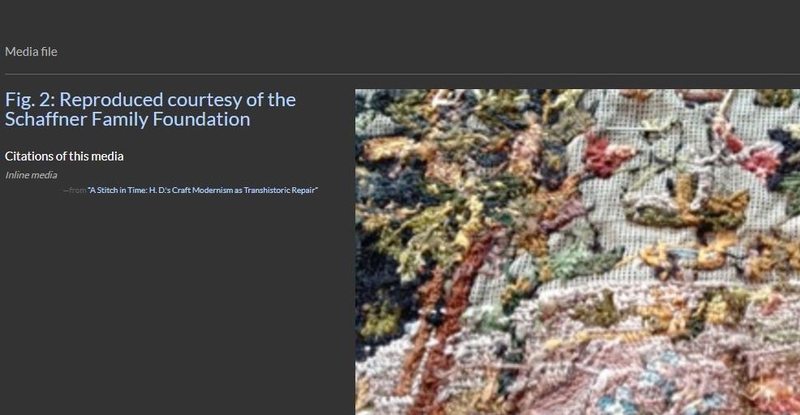 Amy E. Elkins of Macalester College published “A Stitch in Time: H.D.’s Craft Modernism as Transhistoric Repair” in The Space Between: Literature and Culture 1914-1945, vol. 12, no. 6 (2016). Elkins’s abstract notes that her “essay presents, for the first time, an archive of H.D.’s needlework and demonstrates its relationship to her literary craft.” The essay is filled with rich images of H.D.’s embroidery, and Elkins links that work to psychological strategies of coping and survival in the wake of World War I. This month’s Modernism/modernity Print Plus platform features “Mind the Gap! 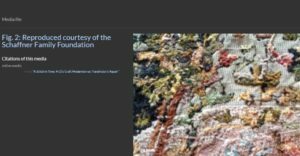 Modernism and Feminist Praxis.” Articles by Madelyn Detloff, Anne Fernald, Rowena Kennedy-Epstein, Cherene Sherrard-Johnson, and Ewa Ziarek take up the issue from a range of perspectives. 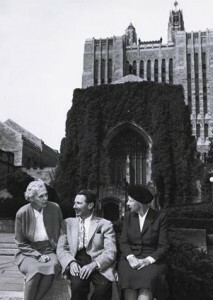 Kennedy-Epstein’s “The Spirit of Revolt: Women Writers, Archives and the Cold War” begins with a curricular debate about the role and literary heft of H.D. in modernist studies today. Her defense of H.D. and other modernist women writers is wide-ranging and offers a compelling argument for ensuring that women writers feature prominently in the literary landscape. 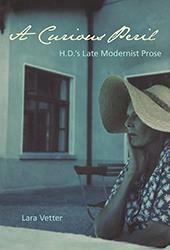 The University Press of Florida has just published Lara Vetter’s new book, A Curious Peril: H.D.’s Late Modernist Prose. The monograph offers readings of a range of H.D.’s post-World War II writing: The Sword Went Out to Sea, By Avon River, White Rose and the Red, The Mystery, Magic Mirror, Compassionate Friendship, and End to Torment, with briefer discussion of Thorn Thicket, the Hirslanden Notebooks, and, from earlier in H.D.’s career, The Moment and Palimpsest. It also includes a chronology of H.D.’s writing from this period and an appendix mapping works that H.D. owned or read that inform Vetter’s discussion. and Spirituality: A Piercing Darkness, edited by Elizabeth Anderson, Andrew Radford, and Heather Walton, has been released by Palgrave (January 2017). 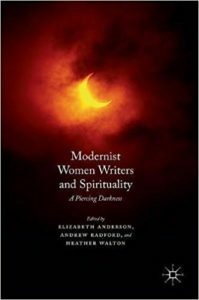 Contributions by Suzanne Hobson and Matte Robinson focus on H.D., alongside chapters devoted to a range of other modernist women writers, including Mary Butts, Jane Harrison, Dora Marsden, and many more. Rebecca Bowler has published a review of Matte Robinson‘s The Astral H.D. in a recent issue of Literature and Theology. The review highlights H.D.’s contributions to the study of occultism and to its adaptation into literature as part of the intersection of literature and theology more broadly. Poet and H.D. 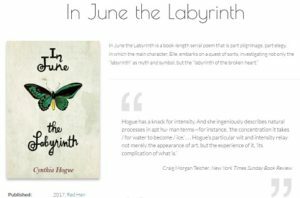 Scholar, Cynthia Hogue, has published her ninth poetry collection, In June the Labyrinth (Red Hen Press, 2017). This book-length poetry sequence shares a mythopoetic approach often found in H.D.’s poetry as well. Excerpts from In June the Labyrinth have also been featured in Tupelo Quarterly. Cynthia Hogue served as the Distinguished Visiting Writer at Cornell University in the Spring of 2014. She was a 2015 NEA Fellow in Translation, and holds the Maxine and Jonathan Marshall Chair in Modern and Contemporary Poetry at Arizona State University.